Dreams came true for Jason Anderson and Rockstar Energy Racing under the lights of Sam Boyd Stadium in Las Vegas. As the checkers waived for the last time in the 2014 West Coast 250 Championship, Anderson crossed the finish line a champion. Not only did Jason garner his first career professional title, it was also the first for the team after a long bumpy road to get there. Coming into the last round of a series with the points lead is certainly the ideal situation to be in. However it's also very trying on the nerves of the whole team. The entire day leading up to racing, it's very taboo to mention anything about the possibility of securing the coveted number one plate. As much as everybody wants to act like they're calm and collected, no one really is. Inside the heads and hearts of everyone involved are the thoughts and feelings of accomplishing the ultimate goal. The tension can be clearly felt in the air because in reality, everyone knows that all the feelings are mutual and the fear that in racing, anything can happen. Something did happen during the break between Seattle and Las Vegas. Jason had a crash while practicing that gave everyone a skip to their heartbeat. He actually damaged his lung in the incident and was forced to stay off his bike, unable to fully prepare for the final round. One thing about Anderson though is that he somehow can always find the positive in any situation. The kid has been working out and riding 7 days a week since October 1st. He looked at the crash as an opportunity to relax, rest and recover. Something he hasn't been able to do for many months. As the gate dropped for the main event, Jason did not get around the first turn in an optimal position. However, neither did Cole Seely. The set up was nearly perfect because Anderson was right behind him, knowing full well Cole would have to beat him by several positions to strip the victory away. All JA had to do was simply follow him through the pack. The downside of the situation was that he was completely surrounded by every one of Seely's teammates who somehow managed to be all in a row in front of him and one behind. This absolutely raises the blood pressure of all on the team with concern that one of them will take Jason out. Fortunately nothing like that happened and credit is due to the TLD team for not applying any team tactics and keeping it 100% clean. In what seemed like the longest race in professional sports history, Mr. Anderson emerged a champion and the 1W number plates were installed on his KTM. Even though Jason was a bit beat up, he still decided to go out and compete in the East/West Shootout. This was also special because it was the only opportunity he would have to run his newly acquired #1 as he will move up to the 450 class next year. In the wake of all the euphoria he raced to yet another podium in 3rd to top off his incredible season. 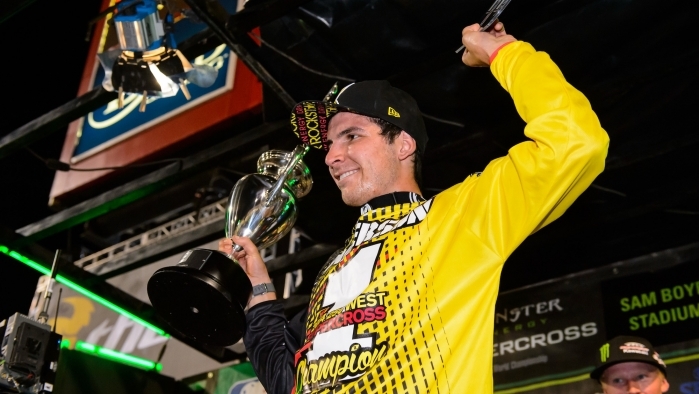 Jason Anderson: "The week before Vegas I had a crash and ended up partially collapsing a lung. I wasn't able to ride the few days prior to the race. It definitely affected my breathing out there but I knew I had it. I could have pushed harder if I had to. I kind of let Cole [Seely] get away a little bit though which I probably shouldn't have, but I knew right where he was. It's been awesome progressing with the team and earning my first championship as well as theirs!" The team will have little time to celebrate as they now set their sites on the Outdoor Motocross Championship. Anderson will carry the momentum from Supercross over as he will certainly be one of the favorites to win the MX title as well. The team we also be rejoined with Davi Millsaps on the 450 and Joey Savatgy on the 250 who have been out with injury the entire SX season.